Last week Nicole and I watched a Bobby Flay Throwdown episode for burgers. 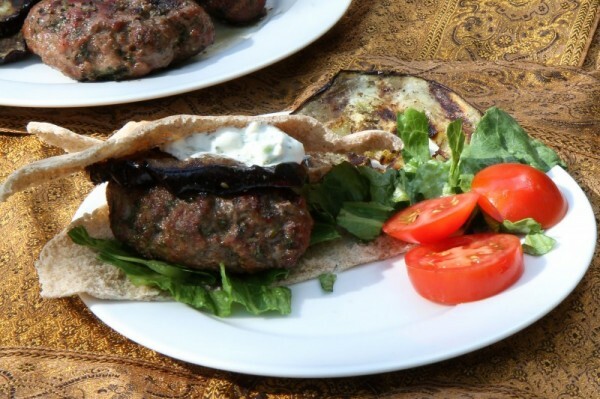 Bobby’s competitor, Susan Mello, put together a Greek lamb burger that Nic really wanted to try. It was OK. Just OK. Certainly no contest winner. I don’t remember who won the actual throwdown, but Susan used this recipe to win 20 large in some other competition. Personally for a burger contest, it should be bacon and cheese all the way. I think Nic and I have gotten used to a much more intense flavor profile from eating so much street meat! Remove the mint. I have recently realized that I hate fresh mint. I hate mojitos, and I hated anything we tried juicing that had mint in it. I barely like basil. I like lifesavers though. Add oregano and garlic to the lamb. For some reason, when I think greek — I think oregano. Having it just on the eggplant is too limited. Grill the eggplant with much less olive oil (maybe none). These soaked up the oil and just seemed greasy. Cut the eggplant thinner to keep it from shooting out. Soften the pita a bit (not sure how, maybe steaming?) Our pitas fell apart really quickly and we wound up with piles of lamb and goop everywhere. I think somehow it should incorporate calamata olives. Maybe a few ground up in the meat? Lamb rocks, especially with the cumin. Mary knew the deal. Loved the feta added to the tzaziki. It was wonderful and a little reminiscent of the blue cheese dip you use with Buffalo wings. Now if I could replicate the giant beans in tomato sauce I had in Corfu I’d be a happy man! I am not a lover of ground lamb, but sometimes it is really good. I find lamb can be deadly delicious, or terrible. I love fresh mint. Bet you don’t like cilantro, either. I love that, too – and basil… and lifesavers, especially the red ones. I think your ideas make perfect sense. Kalamata olives would be great in the meat… and feta in tzitziki would be a nice change, too. But, in the end – totally with you. A burger has to have a lot of beef, some cheese, and I will add, a big slice of fresh onion. Bacon and tomato, too – if you can fit it all in your mouth. There is nothing better, is there? Sometimes it’s the basics that are the best, but Velva has a burger with blue cheese and red wine onion jam that sounds to die for…. I love fresh mint and it is growing wild and crazy in my yard. I am always looking for ways to use it. I use it in cocktails all the time. However, I do I agree with you about mint in one thing, I can do without it in my lamb. I forgot to tell you something, if you want the giant white beans and tomato sauce dish, I just saw it recently on Kalofagas.ca site; it looked really good.